-Brows: Brow Blender in “Soft Taupe” – this is a really cool product because it draws on the brows softly and has a spooley brush on the other end to blend brows just the way you want them. It is almost impossible to make a mistake with this great tool. -Eyeshadow: Mineral Eyeshadow in “Bauble” on the inner corner and brow bone. Crease was Matte Eyeshadow in “Cedar”. Outer corner was “Tornado” Matte Eyeshadow and, for a pop of color, we used Mineral Eyeshadow in “Concord” to accent her beautiful brown eyes. -To finish this look, add strip lashes and a beautiful black winged eyeliner with “Noir” Gel Pencil. My personal philosophy is that makeup should not overshadow the person. 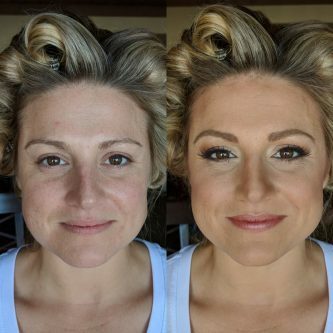 On Instagram and other social media platforms, the makeup can be so overdone that it looks like a painting and you can hardly see the girl underneath. Don’t get carried away with creating unnatural looking brows or eyeliner that stands out so much that it’s the first thing you see. When you walk into a room, people should see you first for who you are, not your makeup. If you have any questions about this look or techniques or if there are any looks like you’d like to see in the future, comment and let me know.